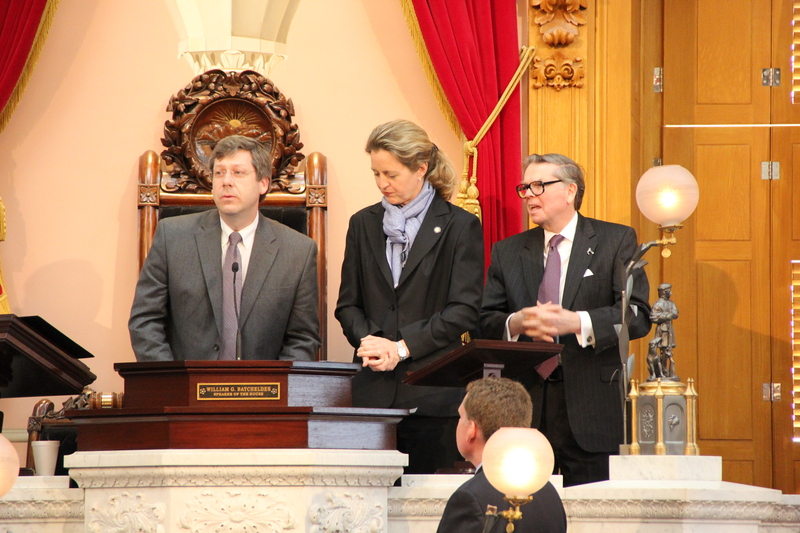 Earlier this year I was invited by Rep. Kristina Roegner, State Representative for Ohio’s 37th House District (standing to my immediate left, in this picture, along with the Speaker of the Ohio House, Rep. William G. Batchelder), to offer the opening prayer for a session of the House. That invitation became reality on Tuesday April 30, 2013. My wife and I journeyed down to the Statehouse in Columbus and enjoyed a tour of that historic building prior to making our way to the House chamber later in the morning. It was the official picture day for the the 130th General Assembly of the House of Representatives, and many school groups were visiting, so the chamber was full. It was an honor to serve the Lord in this manner while also being afforded the privilege of ministering to that legislative body. It was pleasure also to become acquainted with Rep. Roegner who serves as the representative for the district in which I live and serve. She is an ardent advocate of continuing the practice of opening these sessions with prayer. You may view a recording of this session by going to this link and then clicking on the session for April 30. The following is the prayer I prayed that morning. May Your name be glorified because of Your faithful love, and because of Your truth. May Your name be held in honor and be esteemed above all, for You are God above all, and we are your servants. We confess, Lord God, that we are prone to love ourselves, to be wise in our own eyes, to lean on our own understanding instead of trusting in You, and asking from You that which we need. Forgive us. Thank You for these Your ministers who serve the citizens if this great state. Thank You for their willingness to bear the heavy responsibilities of governance. On behalf of them, we draw near to Your sovereign throne of grace, that we may receive Your mercy and Your grace to help us in our need. You, Lord God, have ordained government to be Your servant for the good of its citizens. God, grant them wisdom to know the good they must do as they serve in this distinguished legislature. You have said, “If anyone lacks wisdom, let him ask God, who gives generously to all without reproach, and it will be given him.” Lord, we want wisdom; we ask for that wisdom which is from above, a wisdom that is pure, peaceful, gentle, reasonable, impartial, sincere, and brings with it all the good fruits that ripen in this wisdom. As these, Your servants, minister today in the business before them, help them to see what they do not see and understand what they may not now understand; enable them to wisely test everything, so that they may hold fast what is good. Grant them success in all their endeavors to improve civil conduct, to suppress that which is vile and profane, and to support religion and the promotion of virtue. Heal the divisions, and repair the breaches. Grant, we pray, the safe and righteous continuation of our state government. Let Your gracious blessing attend to that which they do, that peace, and truth, and righteousness may be established in our days and secured for our future generations. Guard us from the pursuit of short-sighted victories that yield long-term consequences of greater hardship. May You, Lord God, help us to order our affairs with discretion and to behave wisely; may these who serve give attention to the way that is blameless, and walk with integrity of heart as individuals, and together as a governing body. As they minister before You, may they faithfully fulfill the responsibilities to which they were elected by the people and to which they were ordained by You. Thank You. This prayer I offer to You, Lord God, in the name of and upon the merits of Jesus Christ. Amen. Rep. Roegner repeatedly asked me to pray for those who serve in the state legislature. Perhaps after you read this post you might want to pause and pray for your own state and national leaders “to rule well so we can be quietly about our business of living simply, in humble contemplation” (1 Timothy 2:2-3, The Message). This entry was posted in Politics, Uncategorized and tagged Politics, Prayer, prayer for government. Bookmark the permalink.